Whether you are short- or far-sighted, or suffer from corneal curvature it is legitimate to dream of a life without glasses or contact lenses! An artificial lens which is implanted in addition to the endogenous natural lens is a modern easy and safe alternative to eye laser treatment. The advantages of implantable contact lenses? 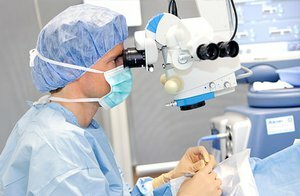 When implanting an artificial lens- also called phake lens implantation - contrary to eye laser correction, no tissue is removed but something is added to the eye. That also permits the correction of very consistent defective vision since there is no limitation regarding the removal of tissue. An additional artificial lens is implanted between iris and natural lens which is exactly adjusted to the individual visual defect. Should the defective vision alter or another option of correction be available, the lens can be removed or exchanged anytime. At the moment EVO Visian ICLTM from STAAR Surgical is the only lens which can be implanted into the eye with a minimal-invasive surgery. 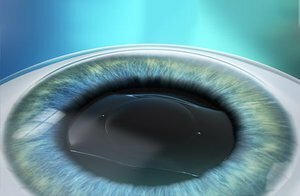 Its well tolerated material and the excellent clinical results are an explicit indication for EVO Visian ICLTM as a safe and gentle alternative to eye laser treatment. Since more than 20 years this lens is used successfully for the treatment of defective vision. Its biocompatible material Collamer has an integrated UV blocker and maintains the natural chemistry of the eye meaning that it is not perceived as foreign body and does not lead to dry eyes. With EVO Visian ICLTM it is possible to treat a wide range of defective vision. Many patients because of a too thin cornea or a short-sightedness up to -20 dioptres cannot be treated with eye laser. Therefore for these patients the implantable contact lens is a safe and uncomplicated treatment method. Our patients are enthusiastic about the fast treatment and the excellent optical results. Start your day with your usual routines. That will help to calm you. Cleanse the eye zone carefully and do not use cosmetic products such as facial cream, make-up or perfume the day before and the day after the surgery. Wear comfortable clothes to feel at ease. Important: During lens surgery an anaesthetist is at your side who if you wish, can administer sedation. You experience the surgery in a drowsy sleep-like form. For this purpose you should be sober. Do not eat 6 hours and drink 2 hours before surgery. You need an accompanying person. It is an outpatient treatment and takes for both eyes approximately 20 - 30 minutes. A bit of excitement and tension are completely normal. Prior to the surgery, we check together all data before anesthetizing the first eye with eye drops. 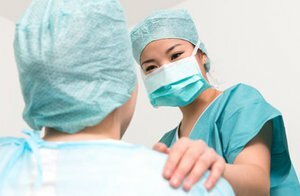 You will not feel something throughout the surgery. To avoid you blinking during surgery, a lid-opener is inserted while the other eye is covered up. The surgeon starts with a small incision of about 2-3 mm at the edge of the cornea. Via this aperture he inserts the folded lens into the eye and positions it behind the iris where it unfolds by itself. During that you hardly feel anything. After surgery the microscopic tunnel incision closes on its own. Immediately after or the next day the other eye is operated. Be careful not to rub your eyes after the surgery. Do not remove the bandage until the next morning. In the first 24 hours avoid showering or washing your hair. Light housework is possible at the day of surgery. We provide you with eye-drops for the first time after the surgery. After 2 to 3 days you can go back to work and undergo sports activities. Hobbies such as swimming or sauna should be avoided for about 2 weeks to minimize the risk of infections. A control of the successful treatment takes place the day after, a week after and one month after the surgery. Should you have any question you can always call upon us. Surgical risks can be reduced to a minimum through conscious behaviour and through our quality management but cannot be excluded completely. But there is a solution for nearly all complications, if patient and physician behave correctly. The employment of modern technologies at our locations as well as regular training, the experience of the operating surgeons and of the whole Smile Eyes team contribute decisively to minimize the risk of ICL surgeries. Since there is an incision in the eye, in extremely rare cases an inflammation inside the eye can occur which necessitates an antibiotic treatment and probably a further surgery. A very limited number of cases with an older lens type showed occasional alterations inside the eye. In order to exclude alterations, a routine ophthalmological check every one or two years is recommended. Should alterations occur - a very rare precedent - it is possible to take action and for instance exchange the lens with another model. In order to exclude possible risks, extensive preliminary and follow-up examinations as well as comprehensive patient care are implicit in the Smile Eyes centers.